We have no doubt that you will see what sets us apart from other roofing companies in the Innisfil area. Before we began our business, our founder at Slippery Slope Roofing decided to look at what other roofing companies were doing and figure out how to do those things even better. This led us to do things quite a bit differently, and we have many satisfied customers who are convinced we made some great choices. When you are looking at roofing companies, consider the following questions. Are they insured? You would think all roofing companies would be insured with the WSIB like we are, but sadly that is not always the case. In addition to being fully insured, our team is trained in safety protocols, including using safety gear and techniques. How many projects do they do concurrently? 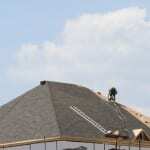 Most roofing companies juggle many homes at the same time. Our philosophy is to do one project at a time in order to provide unparalleled service and results. By concentrating on one job at a time, we get it done quickly and properly. Is installation done to manufacturer standards? This is a big one because if the shingles are not installed properly, the warranty is null and void. There is a good chance your roof will not reach the lifespan it should, and you will have no recourse if the warranty can’t be enforced. Not only do we follow all manufacturer requirements, but we also back it up with a 10-year warranty on our workmanship. How much experience do they have? Our founder and foreman have 50 years of combined experience in the roofing industry – far more than most roofing companies in the Innisfil, Ontario area. We have no doubt that you will see what sets us apart from other roofing companies throughout your experience. If you need roofing installation, replacement or repairs, call us at Slippery Slope Roofing for an exceptional experience. At Slippery Slope Roofing, we are one of the top roofing companies serving Barrie, Orillia, Bradford, Alliston, Newmarket, Cookstown, Beeton, Innisfil, Angus, Collingwood, Wasaga Beach, Oro-Medonte, Midland, Midhurst, New Tecumseth, Clearview, Bradford, Essa, Stayner, Springwater, and surrounding areas of Ontario.